It’s been three months since we last checked in on Coulson’s crew, and things sure have gotten bleak for this group. 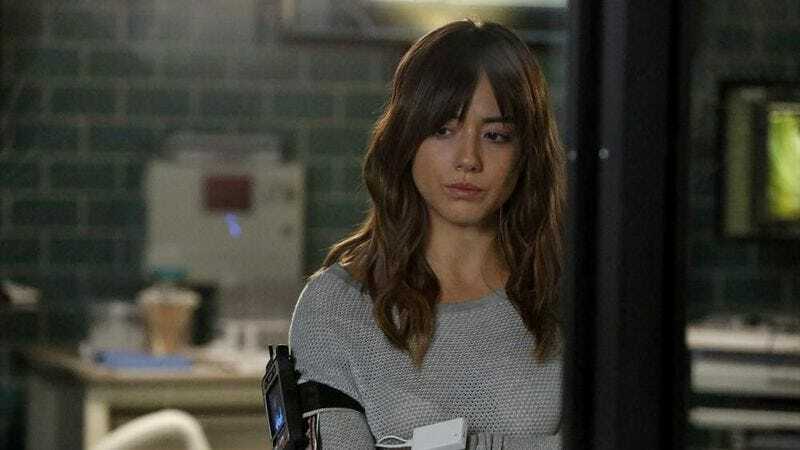 Trip is dead, Skye is in quarantine, and everyone is tossing around the blame, making “Aftershocks” quite the dour installment of Agents Of S.H.I.E.L.D. It’s an episode that shows just how different this show is from Agent Carter, but also highlights what the two series could learn from each other. After the colorful, cheeky retro fun of Agent Carter, it’s hard not to notice just how bland S.H.I.E.L.D.’s visual design and scripting are. “Aftershocks” is an overwhelmingly gray episode, and it had me pining for the vibrant costuming and décor of Peggy’s time period. There’s no reason for S.H.I.E.L.D. to be so drab, and even gritty superhero shows like Arrow and Gotham find ways to incorporate color through costumes, sets, and camera filters. The palette for “Aftershocks” is dominated by dull blue, black, gray, and brown, so it’s very refreshing when there’s a rare pop of color like the neon blue of Gordon teleporting or the green of Mac and Bobbi’s secret scanner in Coulson’s office. One of those names is new to the series, belonging to the eyeless individual that appeared at the end of the mid-season finale. Gordon appears in the opening scene as a young man that has recently undergone Terrigenesis and is struggling with his new Nightcrawler-esque teleportation powers, and learns to cope with his abilities thanks to the guidance of Skye’s mother Jiaying. The character appears to be inspired by Reader from Charles Soule’s current Inhuman comic—although considering Marvel Studios’ long-term planning, it’s possible that Reader is inspired by Gordon—and it looks like he has a simplified power, teleporting instead of being able to make what he reads real. An adult Gordon reappears at the end of “Aftershocks” to save a suicidal Raina from masked gunmen, apparently taking on the position that the deceased Jiaying left open. “It’s O.K., beautiful,” he tells Raina after appearing in a bright blue bubble. “I’ll show you the way.” The key word there is “beautiful”; before Gordon’s intervention, Raina plans to kill herself because while she finally got to evolve like she wanted, she ended up a monster while Skye retained her old appearance and gained cool new earthquake powers. I’ve been very vocal about my appreciation for Ruth Negga on this series, and in an episode that features two characters dealing with similarly life-altering developments, Negga is able to capture the reality of Raina’s situation with more emotional honesty than Chloe Bennett’s Skye. As a big fan of the Inhumans in Marvel Comics, I recognize Raina’s struggle as something that many characters have had to deal with after Terrigenesis. She’s angry that her former beauty has been wiped away, replaced by leathery skin, exaggerated facial features, and thorns all over her body. Her insides feel like gravel and she cuts herself every time she moves. Raina is in shock, pained, and afraid, and Negga does great work capturing the character’s whirlwind of feelings and emoting through her facial prosthetics. Raina is the character that feels like she’s truly become something Inhuman, whereas Skye comes across as Skye with more cry-face. (How many bottles of eye drops do you think the crew went through for this episode? There’s no way Bennett was crying for the entire filming.) Skye is mourning Trip for most of the episode before she starts manifesting her new seismic powers, which opens an entirely different can of worms, but Bennett isn’t as skilled as Negga when it comes to finding the reality behind this fantastic situation. Like fellow Whedon alum Eliza Dushku, Bennett has difficulty capturing the full weight of her character’s experience in a way that isn’t overly performative; she’s acting really hard, but she’s acting rather than living her character. I feel like I’m always watching Chloe Bennett playing Skye rather than just seeing Skye. One thing that Agents Of S.H.I.E.L.D. has over Agent Carter is a diverse cast and a number of strong female relationships. Skye interacts with each of the women on the team while in quarantine, and writers Jed Whedon and Maurissa Tancharoen use each conversation to spotlight the different dynamics between the females on the team. May is the stern S.O. 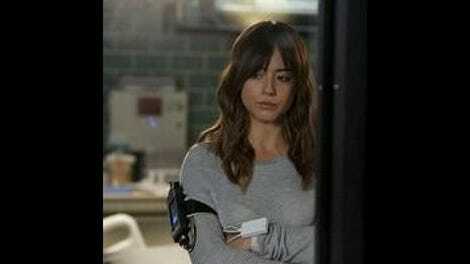 that wants to make sure that Skye is alright but doesn’t want to show too much emotion; Bobbi has been in quarantine before and is the friendly presence that provides Skye with materials to get her through the isolating experience; and Simmons, who was developing some great romantic chemistry with the deceased Trip, is quickly becoming anti-superpower, which will probably cause some friction when she learns that Skye can create earthquakes with her mind now. Even with the considerable improvements made to the cast and plot in season 2, S.H.I.E.L.D. is still missing that special something that made Agent Carter such an immediate standout. Hayley Atwell was that special something for the 1940s-set series, and while I would love to see Peggy appear on S.H.I.E.L.D. via time travel or as an L.M.D., this show needs to find a way to make one of its established characters as captivating as Captain America’s former flame. Coulson could be that figure if the writers took him out of serious mode and allowed Clark Gregg to have some more fun with the part, but there are plenty of strong actors in this cast that could make the show more engaging if they were given more spotlight. Season 2 of S.H.I.E.L.D. has had a much stronger narrative through-line than the first, but the writers need to make sure that the character work doesn’t get buried in the larger plot motion. The team gathers to reminisce about Trip at the end of this week’s episode, but Trip was a largely tangential character that never had the opportunity to reveal his full depth to the audience. His teammates saw it off-screen, but that doesn’t mean much. “We’re gonna laugh a lot less,” Skye says in this episode’s final moments. “That’s for sure.” But the moment would be a lot more effective if the show had spent more time showing those moments of laughter with Trip in the past. Marvel Comics released its S.H.I.E.L.D. ongoing series during the break, and the book is a lot of fun from writer Mark Waid and a rotating line-up of excellent artists including Carlos Pacheco, Humberto Ramos, and Alan Davis. The book takes the Agents Of S.H.I.E.L.D. characters (Coulson, May, Fitz, and Simmons) and teams them with popular faces in the Marvel Universe, doing what the show can’t do because of budget/media rights/Marvel Studios’ plans. So you can get an issue where Simmons is a substitute teacher at Ms. Marvel’s school and bonds with Kamala Khan because they both hide their secret identities from their parents. Like I said: lots of fun. The violence in this episode is a lot more severe than what we normally get on this show: Raina is slitting throats left and right, and there’s a surprisingly graphic shot of a Hydra lieutenant getting shot in the head when Bobbi and Lance reveal Coulson’s successful plan to turn Hydra operatives against each other. A secret agent show shouldn’t shy away from violence, and the action definitely has more impact this week. Adrianne Palicki is a series regular now, which makes me very happy. She has loads of charisma, and she’s great in action sequences. Now she just needs more to do. Apparently Radio Shack is a Hydra front, which means bad news for Hydra. Judging by her unnecessary flipping into battle, it looks like May has been getting fighting lessons from the archers on Arrow. I’m sad that this show killed off Jiaying because I really like Dichen Lachman as an actress and would like to see more of her on this show. Maybe there will be more flashbacks to Jiaying helping newly transformed Inhumans. Next week: Sif returns! Also: Skye breaks more stuff.